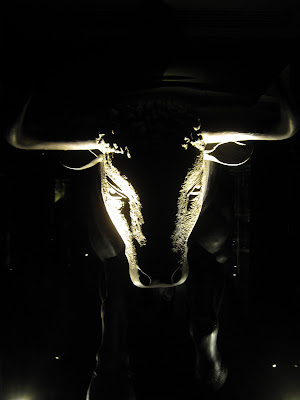 DOS HERMANOS: GO EVERYWHERE, EAT EVERYTHING: AQUA NUEVA: FEELING BULLISH ? I'm not sure whether it was kismet or just plain chutzpah that meant that the sinister-sounding Aqua Group are opening not one but two huge restaurants in the heart of London's West End just as one financial turndown is ending and business rates in the area are increased by similar multiples to the wine markups in Aqua Nueva, the Spanish half of the operation. Or maybe it’s just a little bit bonkers. It seemed that way as I made my way through the darkened foyer and up in a mirrored lift that expresses you straight to the top floor of the former Dickins and Jones Department store. I was then deposited you in a large dark room where some attractive young women gave me the tour. Occupying pretty much all of the top floor there’s three (count’em) terraces although as we’re only the fifth floor the view isn’t as wonderful as you would hope for. In fact if you want to see the sights (London Eye, Canary Wharf) then you have to schlep to a small terrace the other end of Aqua Nueva otherwise it’s the rooftops of Mayfair for you, dear reader. Things were thankfully a little more restrained in the Spanish restaurant with a vaguely Moorish theme that informs the décor. There was a more glam side to the dining room but it appeared to be out of bounds to Billy No Mates like me. I think they were quite relieved when I changed my table that I didn’t ask to be moved there. Actually, the staff weren’t bad especially my waiter who seemed to tolerate my endless requests – I was in a particularly curmudgeonly mood this night – with friendliness and patience although as in many places they got a bit more useless as you moved up the pecking order. The food ? Well, in parts, it was better than I expected but nowhere near as good as I hoped, especially at these prices. Everything just needed a lot more care. Take for instance the Olive Oil. 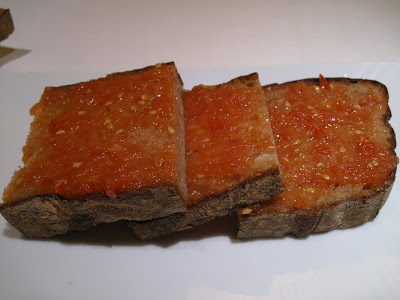 It came from a town close to Jaén which I recently visited. It was nice and peppery and needed some hunks of decent white bread to dip into it. Instead, and I may be wrong, but it was if the kitchen had hopped down to the big Waitrose on Oxford Street and bought some Poilane Sourdough and Raisin bread. Which would have been fine if they hadn’t let it go stale. 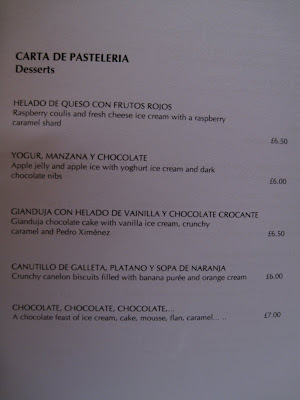 And charge £3.50 for it. Who said rip-off ? I also suspect the local supermarket may have been responsible for the wine. 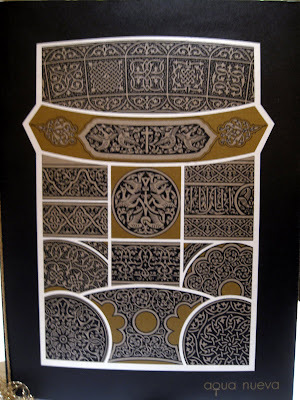 For a Spanish restaurant there were precious few bottles from the Iberian peninsula. The bottle of Albarino I initially chose was unavailable and one of the managers usefully pointed me to one costing twice as much. 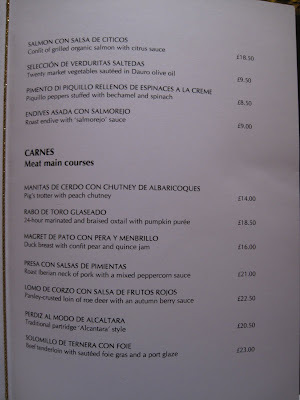 Shopping trips aside there’s an ALC menu but if you ask nicely you can get one for Tapas as well. 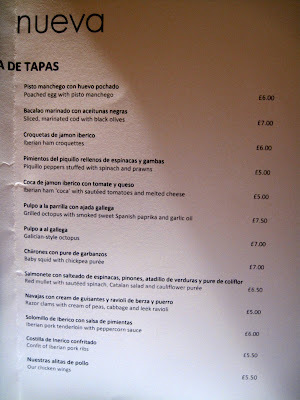 I say tapas but from the prices we’re really talking first courses or dishes in a tasting menu. They came in a slow procession as well with slightly too much of a gap between each one. 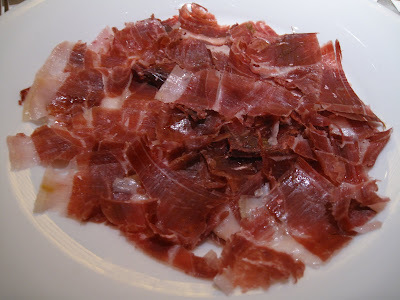 Jamón is a good test of any place serving Spanish Food. It’s deceptively difficult to get right. Here, the ham was of good quality and was cut thinly but the presentation was lacking, there was not enough fat and a surfeit of dry pieces. Not really what you expect for £18. 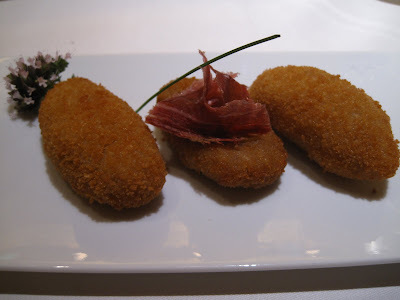 Croquetas – another benchmark – were nicely cooked, the béchamel was a bit runnier than I like it and you had to hunt for the nuggets of ham but not a bad effort. 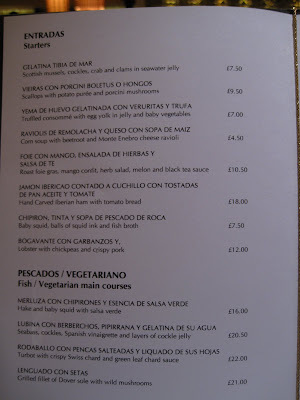 The fishy tapas were more interesting although the prices were gasp-inducing. Slightly chewy chipirones came on an over-processed chickpea puree. 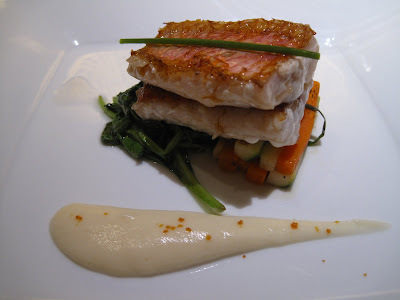 Fillets of Red Mullet had been accurately cooked so they were still firm although there was a residual whisper of stale oil – perhaps from the plancha. 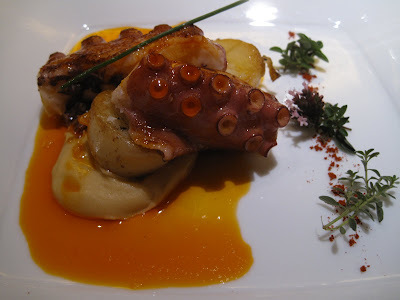 Octopus was some meaty, tender chunks of the tentacles but as with some of the other dishes there was a tendency to irrelevant garnishing. Mind you, if irrelevant garnishing is as bad as your day is going to get then you’re probably doing bloody well. 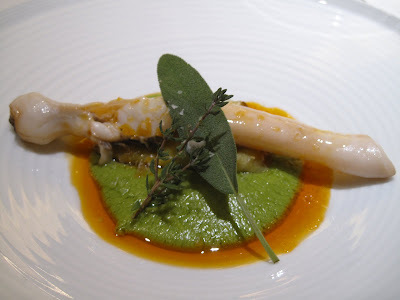 There was a seafood in jelly dish which I didn’t order but was glad of that fact after a single bite and my Razor Clams was a singular bivalve looking rather lonely on a splodge of pea puree. I’m not sure it was an improvement over more straightforward preparations. So far so underwhelming. The kitchen managed a real stinker for the next course though. 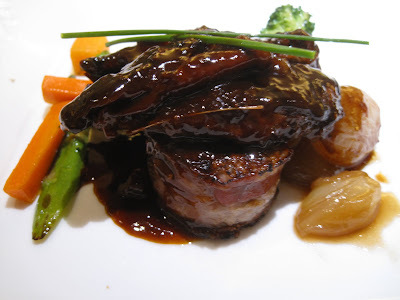 Some Partridge – it was hard to determine which part, breast maybe – had been cooked so it had dried out then covered in a sweet, heavily reduced sauce. There was a little offaly forcemeat sausage that tasted ok, but the rest was very hard-going. So much so, I couldn’t face any sweet. Feeling slightly queasy is never a good way to leave a restaurant. 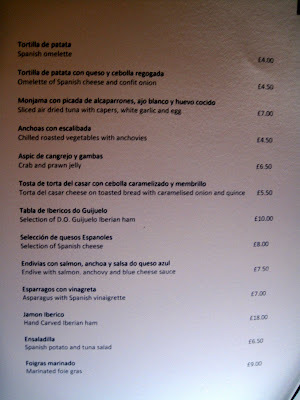 To be honest I think this is as good as the food is going to get so I’m not sure why you’d choose Aqua Nueva over the myriad of other Spanish joints now open all over W1. It doesn’t really have, to these eyes, the necessary bling factor either to pull in the high-rollers. So that’s foodies and Ashley Cole accounted for. Which only leaves the B&T crowd when they’ve got too old for Tiger Tiger or your friends from a small provincial town, say Manchester, who appreciate this sort of style. Mancs, your lift awaits. Why is almost every dish garnished with chives? 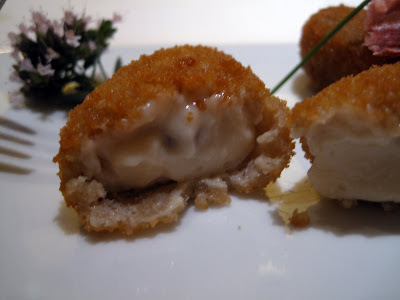 The croquetas do look very nice, though. i would suspect that's no-where near glamourous enough for manchester folk! Sounds like many places in London...long on promise but short on execution . I walked by a pub you used to like "the Princess" and noticed it was being re-done .The workmen said new owners and new menu and it opens this week with a price reduction as they seek "feedback".Maybe you could try it for us? Should your review not be "feeling bulli-ish"? Ha Ha. Very good. That's why I'm still a rank amateur at this blogging lark. A touch of the Hollyoaks about it? Was really interested to read this. 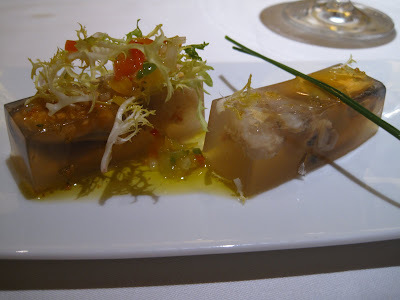 The Aqua group's restaurants in Hong Kong are a little pants (once served a Kir Royale in a wine glass, etc.) . They're really nothing to write home about, except that they lucked out with an extremely awesome location with a fantastic view of HK Harbour. 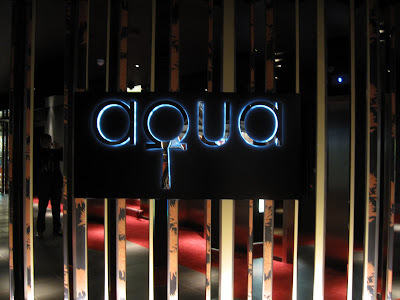 I was pretty surprised to hear about the expansion to London considering how average the Aqua restaurants are. Dim Sum Diva's experiences are certainly very different from mine! I'm a regular customer at Hutong and Aqua, and I've had some great nights there over the years. Michelin gave Hutong a star earlier this year, and they're pretty decent judges. 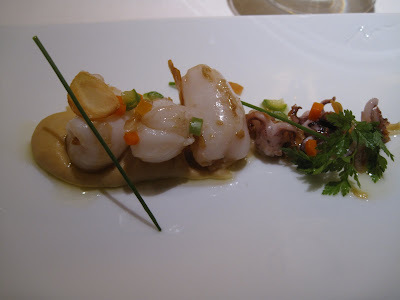 I went to Aqua Nueva during its first week, and the food and service were excellent. Looking forward to sampling their Japanese place too. 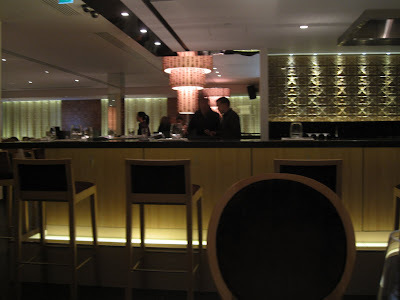 I'm a Hong Konger and have really been wowed by the Aqua Group's restaurants. Their Japanese is the best in town and beats Nobu and Zuma hands down! I can't wait to try their new place in London. Oh and Dim Sum Diva would you like a glace cherry with your Kir Royale? Don't think I've ordered a Kir Royale since I took my grandma out to the pub in 1990!